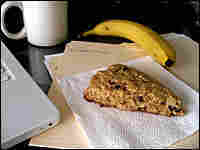 Breakfast Baking: Better Fast Food Breakfast has long been touted as the most important meal of the day. It gives you energy and keeps your appetite in check until dinner. But who has time to eat it? One solution to the modern breakfast dilemma isn't faster fast food, but a mainstay of home baking — the quick bread. In the rush to get to work or school, we often skip breakfast at home — and resort to fast food. But homemade quick breads are a more healthful, no-mess alternative for the commute or the desktop. 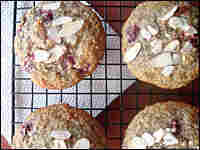 Get recipes for Banana-Raspberry Muffins with Almonds, Mango Colada Muffins and Oat Scones with Dried Cherries and Walnuts, which includes Julie O'Hara's video tutorial, "How to Make Scones." Julie O'Hara is a freelance writer and recipe developer in Fort Lauderdale, Fla. She has written for Shape, National Geographic Traveler, Relish and Self. You can read her food blog, A Mingling of Tastes, or visit her Web site, julieoharawriter.com. I won't commit to calling breakfast my favorite meal — that all depends on what's for dinner. But my ritual of slowly eating and sipping espresso roast while clicking through online news is a pleasure I hate to skip. Breakfast has long been touted as the most important meal of the day. It gives you energy and keeps your appetite in check until dinner. Unfortunately, almost no one has time to eat it. One solution to the modern breakfast dilemma isn't faster fast food, but a mainstay of home baking — the quick bread. The King Arthur Flour Baker's Companion (Countryman 2003) defines a quick bread as "a bread leavened with baking powder, baking soda, or eggs (rather than yeast), and put immediately into the oven, rather than rising on the counter first." All you really need to know, however, is in the word "quick." These baked goods are quick to assemble and quick to bake. They can be sweet, savory, full of fruit and nuts, or plain. They include scones, muffins, biscuits, soda breads, batter loaves and corn breads. Whether you're a parent rushing kids off to school, an urban dweller dealing with the vagaries of public transportation or a student with an 8 a.m. class, fitting in even a bowl of cereal seems difficult. It's more likely that you will grab a bite at a doughnut shop, drive-through or gourmet coffee bar en route to your destination. As greasy crumbs fall down your shirt, or your hands get sticky with icing, you'll wish you had planned ahead for something better. You'll wish you had made some quick bread. Quick breads are the friend of the busy breakfast lover. You can bake a batch of muffins or scones in the evening or on the weekend and freeze them to preserve their just-baked freshness. This really works. Pull one out of the freezer before bed or a couple of hours before you want to eat and grab it on your way out the door. Even if you can't help eating on the run, at least you can add some whole grains and nutrients to your homemade goodies instead of buying food that is just dessert masquerading as breakfast. 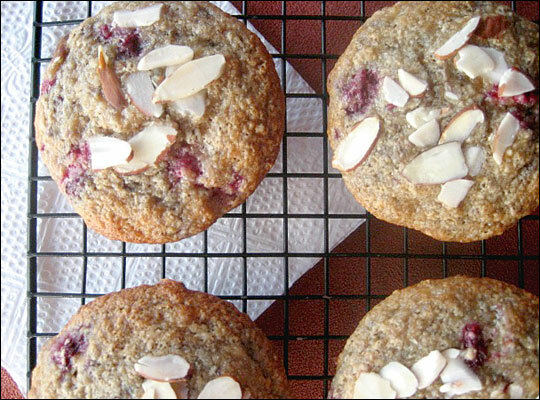 Even commercial bran muffins — at least the ones that taste good — are guilty of fat and sugar overload. Breakfast baking not only adds nutrition to the morning meal, but it also adds cash to your wallet. Money gurus tell us that cutting out the daily $4 latte is one ticket to financial freedom. Add to your coffee windfall the cash and calories you'll save when you give up that Texas-size blueberry streusel muffin, and soon you'll be rich and thin. If breakfast baking sounds good in theory, but you question your culinary know-how, fear not. All you need is three basic principles: measure flour correctly, mix with a light hand and don't overbake. First, fluff up the flour and lightly spoon it into a measuring cup without shaking the cup, which causes the flour to settle and means you'll end up with too much flour and dry baked goods. Then level the flour off with the back of a knife. Second, be gentle when mixing by hand, and stir just until ingredients are moistened. This prevents a tough texture. Success with the third principle depends on approaching the task with a suspicious mind. All ovens and baking pans behave differently, so keep a watchful eye, checking a couple of minutes before the shortest suggested baking time. Muffins and scones are done when a toothpick comes out clean and any coloring leans toward golden, rather than burned. Use the following recipes to start on your way to a life of better breakfasts. They are free of buttery crumb toppings (no greasy shirtfront) and glazes (no sticky fingers), so you can travel without incident. They are moist and filled with flavorful add-ins, so no honey, jam or knives to spread them are required. They're also sturdy enough to eat with one hand, so you're free to carry your reusable mug of home-brewed coffee in the other. And if you get all the way to your office (or class, or volunteer site) before eating your meal, don't be surprised when co-workers — even the inveterate breakfast skippers — demand samples. Whole-wheat pastry flour is lower in protein than regular whole-wheat flour, resulting in tender baked goods that are still high in fiber. A small amount of unbleached all-purpose flour helps add structure. If you don't have whole-wheat pastry flour, use half all-purpose and half regular whole-wheat. Ground flax seeds are available at health food stores and many supermarkets. Preheat oven to 350 degrees. Line a standard 12-cup muffin pan with paper liners. In a large bowl, whisk together the flours, sugar, baking powder, baking soda, cinnamon and salt. In another bowl, lightly whisk the egg with the oil, buttermilk, extract and mashed banana; add to the flour mixture and stir until flour is barely moist. Gently fold the flax and raspberries into the batter. 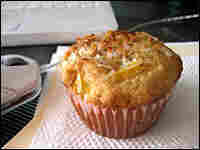 Use a scoop or a quarter-cup measure to fill prepared muffin cups with batter, reaching almost to the top. Sprinkle with sliced almonds. Bake for 20 to 22 minutes, or until a toothpick comes out clean and edges of muffins are golden. Cool in pan for 5 minutes, then transfer to a wire rack. Eat warm or at room temperature. To freeze, cool completely and transfer to a zip-top freezer bag. Defrost overnight in the refrigerator or for 1 to 2 hours at room temperature. Made from a naturally light-colored variety of wheat, the white whole-wheat flour in this recipe behaves and tastes like unbleached all-purpose, except it contains a healthy dose of fiber without appearing too "health-foodish." King Arthur's white whole-wheat flour is available at some supermarkets and health food stores. Whole Foods Market carries both the King Arthur and Bob's Red Mill versions, which can also be ordered from the manufacturers' Web sites. You can substitute unbleached all-purpose, if necessary. The creaming technique of beating the butter and sugar produces a small, cake-like crumb, which is kept tender by the yogurt. Look for dried pineapple rings in the bulk bins at specialty stores, so you can buy just as much as you need. Preheat oven to 375 degrees. Line a standard 12-cup muffin pan with paper liners. In a large bowl, whisk together the flour, baking powder, baking soda and salt. In another large bowl, beat the butter and sugar with an electric mixer on medium-high speed until pale and fluffy, about 2 minutes. Add the eggs and vanilla and beat on medium speed until combined. Add the yogurt and beat until combined. The mixture will appear grainy. Stir in the flour by hand, or use the lowest speed of a stand mixer, until combined. Gently fold in the mango, pineapple and 1/2 cup of the coconut. Use a scoop or quarter-cup measure to fill the prepared muffin cups almost to the top; sprinkle with the remaining coconut. Bake for 15 to 18 minutes, or until a toothpick comes out clean and edges are lightly golden. Repeat to bake any remaining batter. Cool in pan for 5 minutes, then transfer to a wire rack. Eat warm or at room temperature. 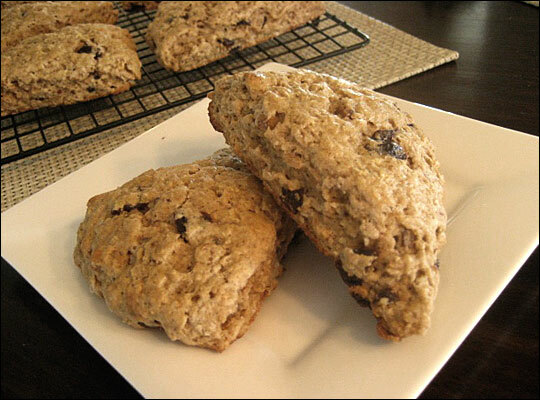 Commercially made scones often contain more butter than is necessary and end up greasy. These scones get their moist, tender texture from buttermilk and a judicious amount of butter gently worked into the dough by hand. 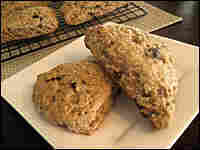 The quick-cooking oats provide a subtle nutty flavor and create a dense scone without the grainy texture of rolled oats. Toasting the walnuts (spread on a baking sheet and roast at 350 degrees for 8 to 11 minutes) is essential to bring out their flavor. White whole-wheat flour is used for its nutrients and mild flavor, but unbleached all-purpose may be substituted. Have all ingredients measured and ready. Once the butter comes out of the refrigerator, it is important to get the scones in the oven as quickly as possible. In a large bowl, whisk together the flour, sugar, baking powder, baking soda, salt and cinnamon. In a separate bowl, whisk together the egg, 1/2 cup buttermilk and vanilla. Add the cold butter cubes to the flour mixture and use your hands to work them into the flour, breaking up and flattening some of the chunks as you go, for 1 to 2 minutes, or until you have some shaggy pieces and some small chunks of butter remaining (you can also do this with a pastry blender). You will still have plenty of loose flour, not a cohesive dough. Add the egg mixture to the flour mixture and stir for a few seconds to barely moisten the flour. Add the oats, cherries and walnuts, and stir gently just until ingredients are combined. The dough will be thick and will not come together into a ball. If you still have some dry oats or bits of flour at the bottom of the bowl, add up to 1 tablespoon of buttermilk, a few drops at a time, so that all of the ingredients are just moistened. You don't need a wet dough in order to pat it together in the next step. Turn the dough onto a lightly floured surface and pat it together into a ball with floured hands, kneading once or twice. Flatten the ball into a thick disk and roll it into a circle, about 8 inches in diameter and 3/4-inch thick. Lightly dust the dough and work surface with flour as needed to prevent sticking. Cut the dough into 8 wedges with a large, floured knife and transfer the cut scones to the prepared baking sheet, leaving about 1 inch of space between the scones. Bake for 13 to 15 minutes, or until bottoms are golden brown and a toothpick inserted in the center comes out clean. Cool on baking sheet for 5 minutes, then transfer to a wire rack. Serve warm or at room temperature.